Oh hi, it’s been a long time. For the past 8 months I’ve been adjusting to a lot of change. I don’t think I actually sat down and reflected on how much change it had been: a new job for me, a new job for my partner, a new house in a new neighborhood. I’ve been pouring a lot of myself into all of this (especially the new job). I’ve been cooking a ton, from my collection of cookbooks that is rapidly growing. And then the other day, J said to me, “you don’t blog anymore.” And I realized that I had spent the last 6 months focused so much on other people’s creative projects, believing in them, thinking creatively about their work, that I’d kind of forgotten about my own. I started thinking about blogging again, and just felt like I had no creative ideas. I’ve been cooking from so many amazing books, what unique perspective do I have to add? Why would anyone care? I think a lot of creative people experience this feeling of creative burn out: “well what makes me special?” “I’m sure there are a million recipes just like this one online” etc. But then I thought about some advice I’d given a friend who was in a similar creative rut. “Just let go of the obsession with being unique or groundbreaking and do something you think is great, something you enjoy.” So I thought about the asparagus I’d just bought. And some warm toasted halloumi. 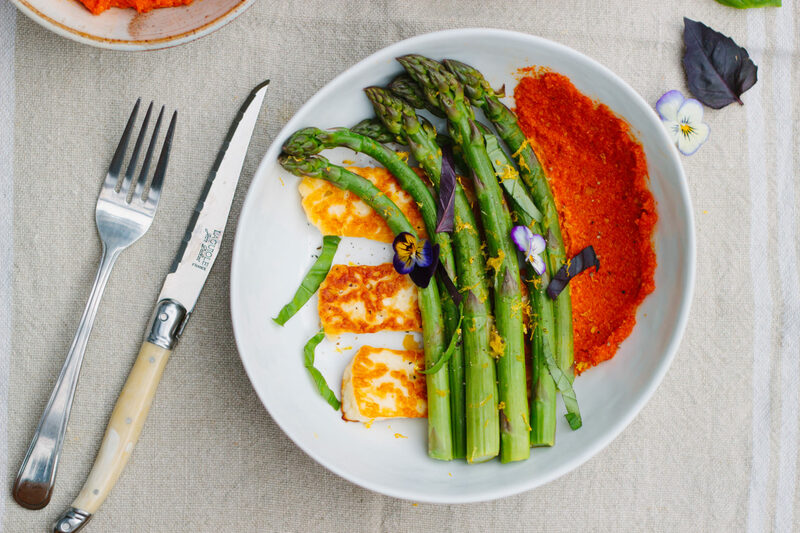 And a romesco sauce I’d recently fallen in love with. And I remember that the kinds of recipes I post are the just food I actually cook, and so who actually cares about it being groundbreaking. So, after some winter hibernation, just in time for the produce to start returning to the market, I’m back. 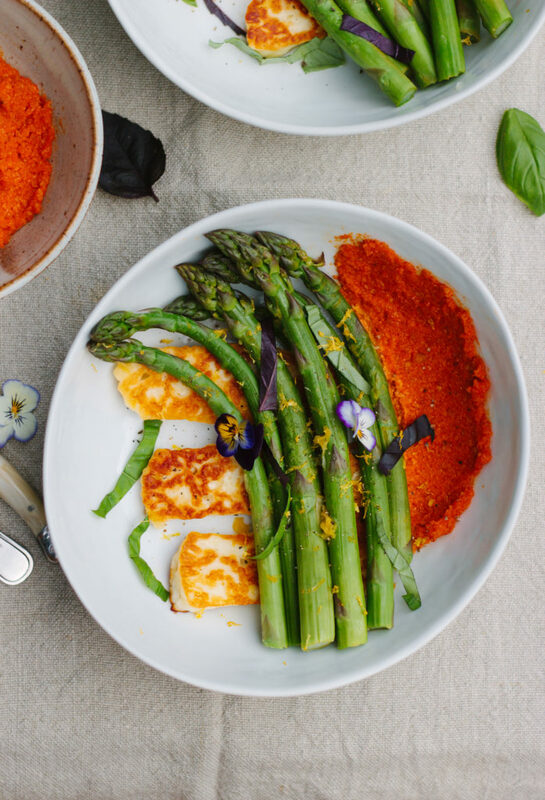 The romesco sauce makes way more than you need for this recipe, but that’s perfect because it goes well on everything! Eat it on toast, with chicken, steak, pasta, eggs, grilled veggies…I read in Spain its served with charred new spring onions, which i think would be lovely. 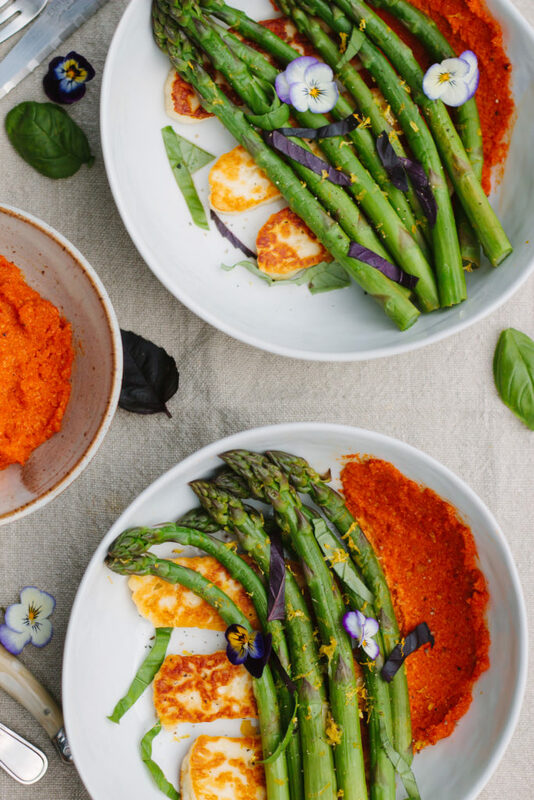 Make the romesco by pureeing everything together in a food processor on high until smooth. 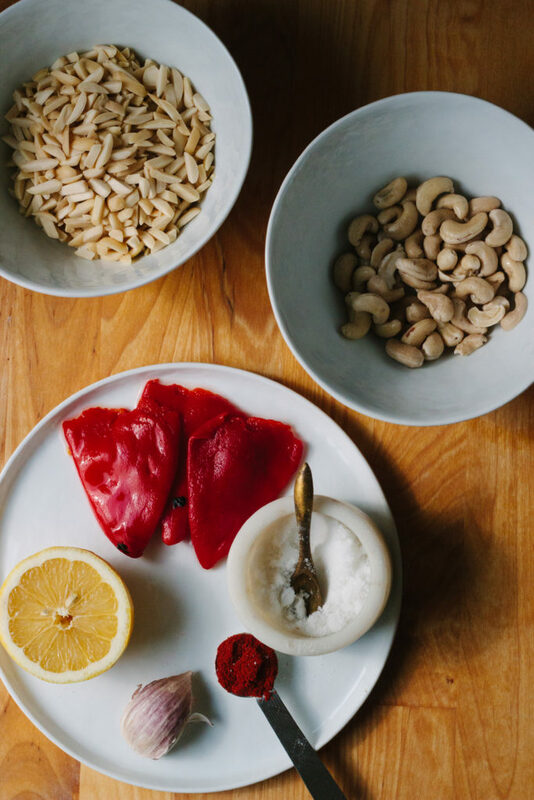 Add chili flakes, and more lemon juice, s&p to taste. Set aside. In a steamer over boiling water, steam the asparagus for a few minutes, until you can pierce with a knife but still vibrant and firm. Set aside to cool to room temperature. Slice halloumi into 1/2 inch slices. Heat 1 tablespooon olive oil in a non stick or well seasoned cast iron skillet over medium high heat. Once hot, add your halloumi slices and cook 3-5 minutes, until nicely golden brown, then flip. Cook another 3-5 minutes then set aside. Toss cooled asparagus with the lemon zest lemon and juice, and some salt and pepper. 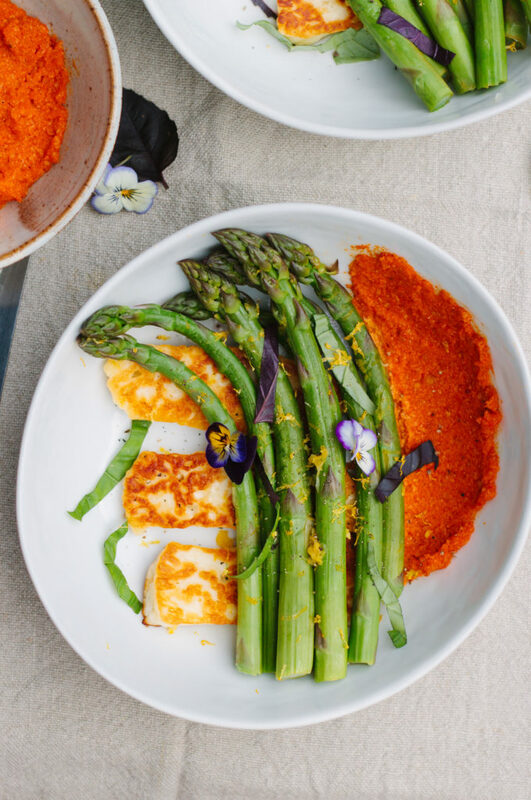 Plate it up: put a nice schmear of romesco on the plate or bowl, top with halloumi, asparagus, and top with chopped herbs. This is gorgeous! And just what I want to eat tonight. I’m so glad to see you back here again.